The power to mesmerize is in your eyes, with this make-up hypnotize. 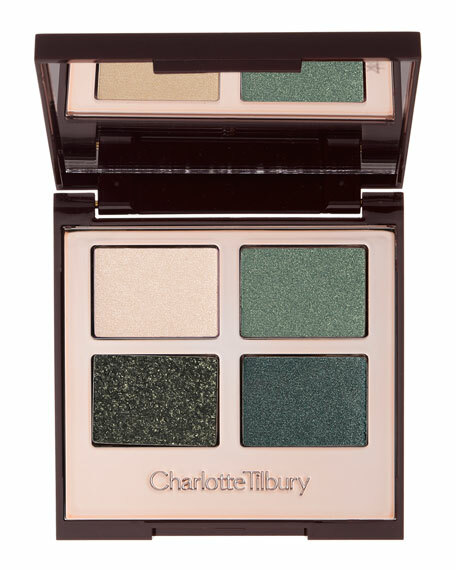 Charlotte has decoded the secrets to iconic, mesmerizing eyes with my Colour-Coded Eye Shadow Palettes. Each one contains four harmonious color ways that offer a complete "desk to disco" eye color wardrobe and an easy to use application ritual that is fail-safe to follow. It's my artistry made effortless! A color-coded eye shadow palette that blends seamlessly into 3 looks, from DESK to DUSK to DISCO with Colour-Coded Eye Shadow Palettes. Each one contains four harmonious color ways that offer a complete "desk to disco" eye color wardrobe and an easy to use application ritual. STEP 2: Nestle the ENHANCE shade in the outer corner of the eye socket using my EYE SMUDGER BRUSH and blend. Then using my EYE SMUDGER BRUSH apply the ENHANCE shade along the upper and lower lash line. STEP 3: Using the EYE SMUDGER BRUSH, blend the SMOKE shade. STEP 4: With your ring finger, apply the POP shade to the center of your eyelid for amped up glamor from the outer corner of the eye, upwards and into the socket. Then using the EYE SMUDGER BRUSH apply the SMOKE shade along the upper lash line and into the socket in a half-moon shape. Also run it along the lower lash line. For in-store inquiries, use sku #136165.